Easy to Clean. Custom-Designed. Beautifully Installed. The double hung is considered by many to be the traditional American window. It’s styling features two vertically-operating sashes, allowing for maximum ventilation. The windows are classic in design, from the sleek sight-line interlock and the routed tilt latches, to the clean-looking, crisp balance covers. 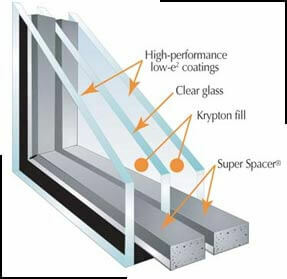 These “simple” elements prove the Clear Choice Energy Solutions is concerned about even the seemingly small details and that a window can be beautiful and energy efficient. Triple-seal weatherstripping at the sill and head pocket. Triple Dual-seal on the sash.